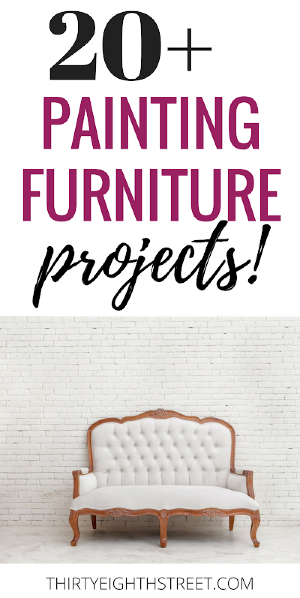 Dry brush painting furniture is a fun and simple furniture painting technique that adds dimension, color and interest to your furniture! 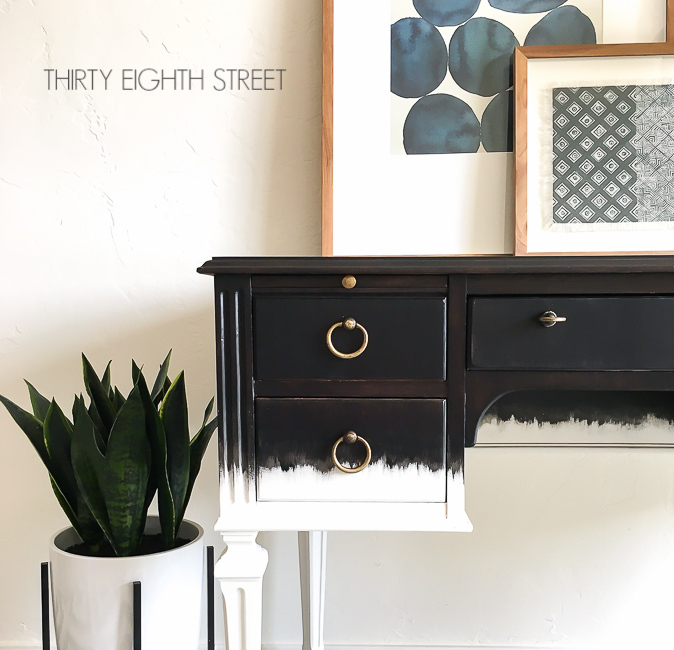 By layering paint vertically we transformed an old desk into an amazing piece of art! 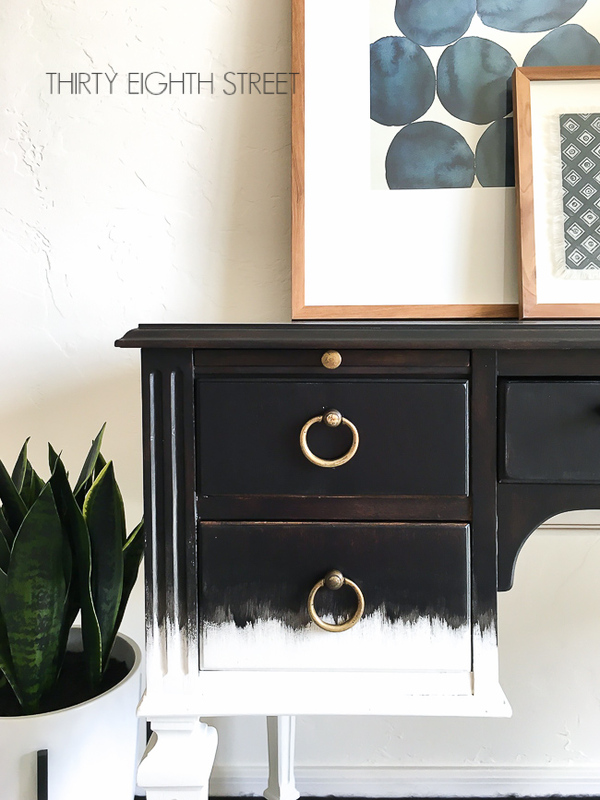 In this tutorial, you'll learn a variety of layering and dry brushing paint techniques so you can tap into your creativity and imagine up your own works of furniture art! What Is Dry Brushing With Paint? 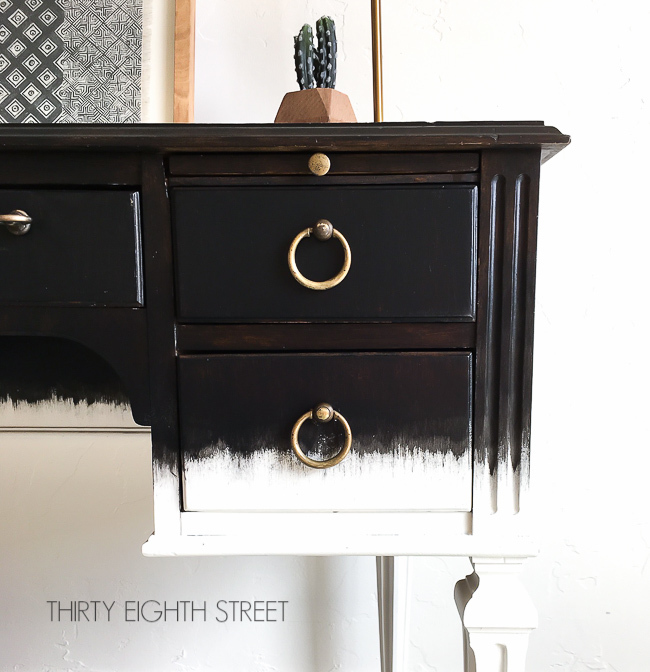 How Do You Dry Brush Paint Furniture? Dip your paint brush lightly into your paint. Tip! 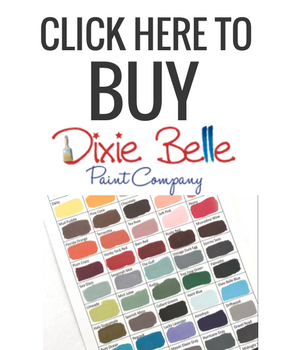 If you slowly tip your paint can (with the lid on) from top to bottom you'll not only give your paint can a good mix, you'll get paint onto the backside of your paint lid. Once you take the lid off, the underside becomes the perfect surface for dipping your paint brush when dry brushing. Wipe off your excess paint onto a paper towel. You can view a short video at the end of our Revamped Media Console Makeover post if you're interested to see how we do this. Apply light pressure. After you've wiped off your excess paint, lightly brush your paint brush against your raised areas or the flat surfaces of your project. 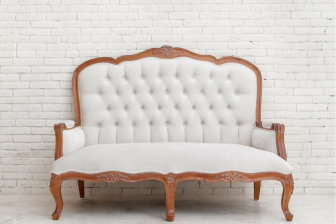 It should feel like you're feathering out your paint color. Tip! 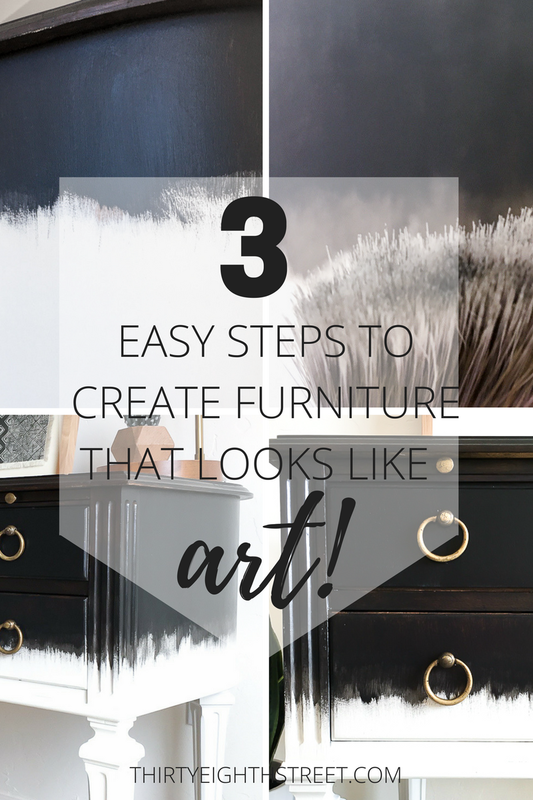 If you're feeling nervous, practice applying light pressure on your furniture piece without any paint on your brush. You'll be a pro in no time! 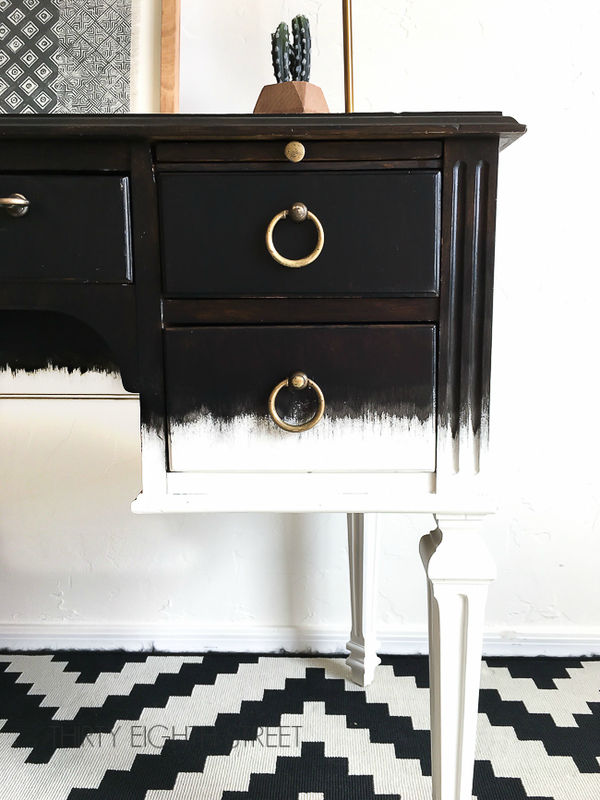 Layering Chalk Paint, Color Blending & Dry Brush Painting Tips! Now, that we've explained what dry brush painting is and you've seen a few examples of how it can be used, I want to show you what dry brushing looks like when you apply it vertically! 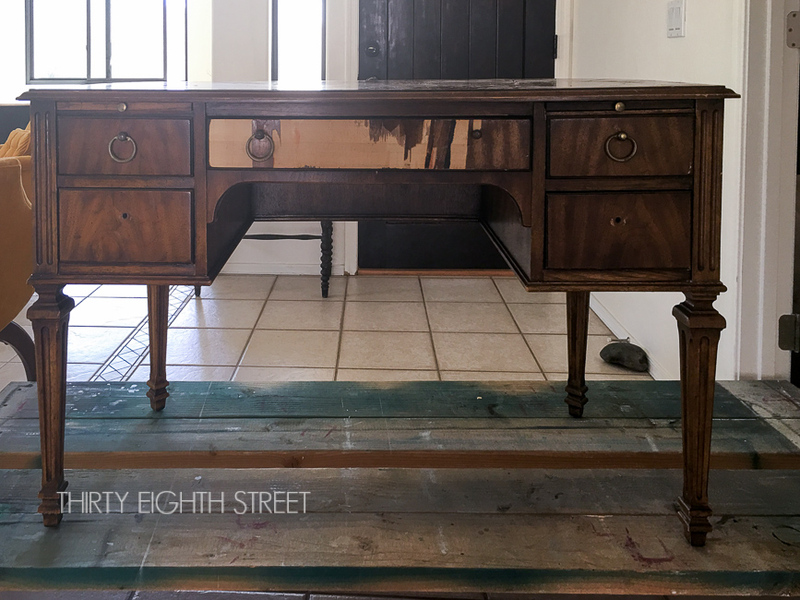 We're calling this fun makeover, The Carter Desk Project. A friend of mine texted me a picture of this desk they were getting rid of and asked if I was interested in doing something with it. I was happy to take it off of their hands. I think I was the most excited over those round pulls! Lucky for me, enough of the round pulls were tucked away in drawers. 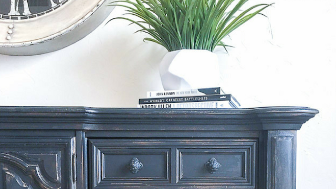 Before, I could update the desk, I would need to remove the old veneer, come up with a design plan and find two replacement drawer pulls for the front middle drawer. Removing the old veneer was a cinch with my HomeRight Digital Heat Gun. I found two pulls that had a similar patina in my hardware stash and my design idea was simple. Make the desk look like a piece of art. How in the world could I accomplish that? I attempted to take a drawing class in high school, however after the semester was over I learned (in the nicest self affirmation way) that "I wasn't good at drawing." Maybe I should lean towards abstract then?... Yep, abstract it is! Stepping out of my comfort zone, I was about to try something new... dry brushing... vertical style... on furniture... abstractly. 1. Select your paint colors. 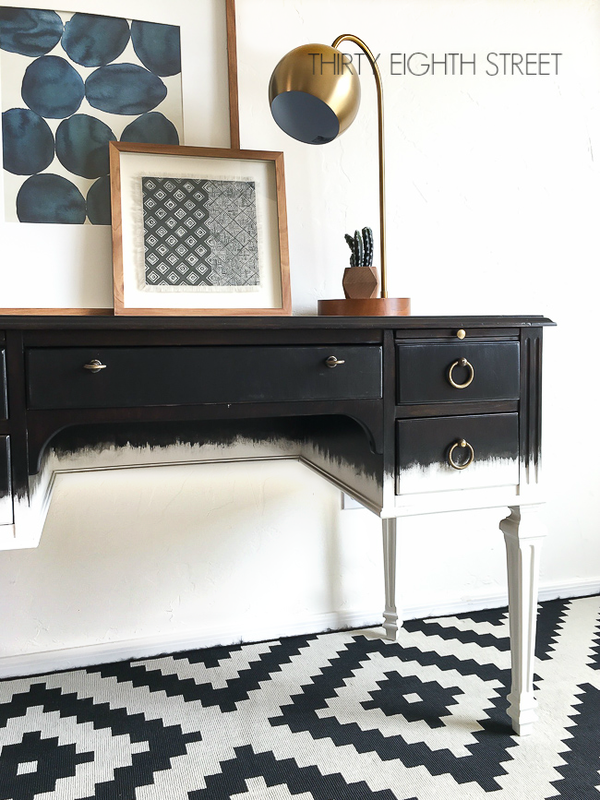 For this desk makeover, I used General Finishes in Lamp Black and Snow White. 2. Paint your lower paint color first. This is the color that you'll be dry brushing over. So, for me that color was Snow White. Give yourself a visual line to follow and then paint your lower paint color above that line a good 2 1/2 inches. 3. Paint your upper paint color. This is the color that you'll be using to dry brush with. For this project, this was Lamp Black. Stop your upper paint color just below the line of your lower paint color so that you give yourself enough distance to drag your paint brush down during the dry brushing step. 4. Blending/Dry Brushing. Blending first. The 2 1/2" gap is too big of a gap to go from a solid color line directly to dry brushing. You need an area in between these two areas to create a nice blended look. 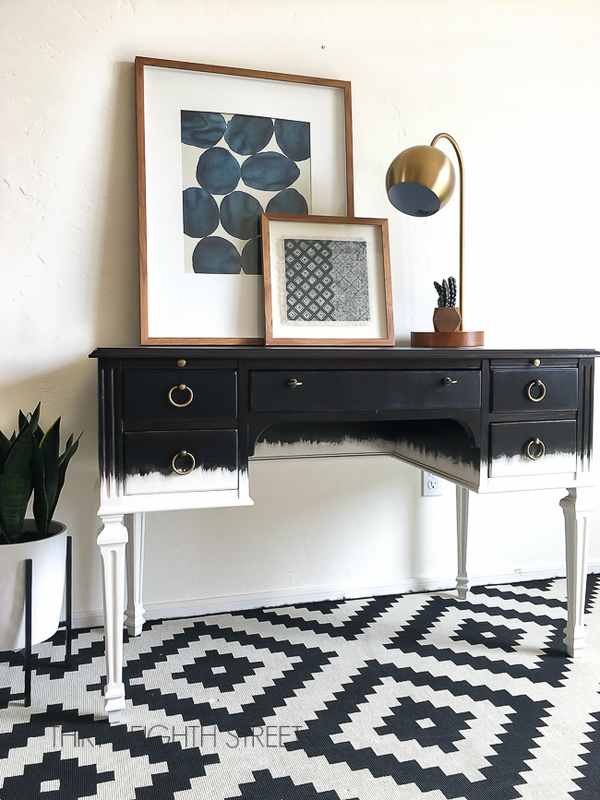 The goal for this blended area is to NOT create another solid horizontal line but rather to create an uneven line with your vertical paint strokes. Load up your paint brush with a little bit of the upper paint color (not dripping) then starting your paint brush roughly from about 2 inches above where your upper paint color ends. Then, drag your paint brush in a downward motion for 3- 3-1/2 inches, varying the distance as you paint around your piece. This gave me a nice blended "grey" tone" and a nice jagged edge to work when it came time to dry brush. Next, dry brushing. I used this paint brush for this vertical dry brush painting technique. Per our dry brush definition above, you'll dip your paint brush into the paint ever so slightly and then rub off the excess onto a paper towel. Using the thin side of your paint brush, start your brush just above your jagged blended edge and with light pressure pull your paint brush downward using a quick, light stroke. You can see how this is done in our video demonstration at the end of our post! Erring on the lighter side is ideal because you can always repeat the process again to get the desired coverage. It's always easier to add more then it is to take away. As you dry brush, your blended area will also receive a little more coverage and that's okay! It helps give some nice flow to your abstract messy jagged masterpiece. After sealing my work with General Finishes Top Coat, I had this to show for my art work! You can watch our step by step guide come to life with our 2 minute video demonstration which can be found at the end of this post! 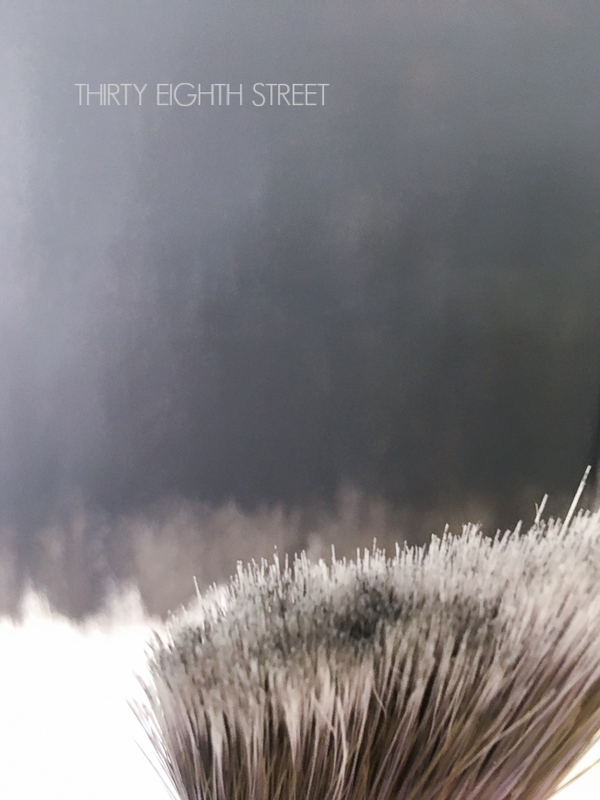 Would you like to see a hands on demonstration of dry brushing? Check out our short 2 minute video! 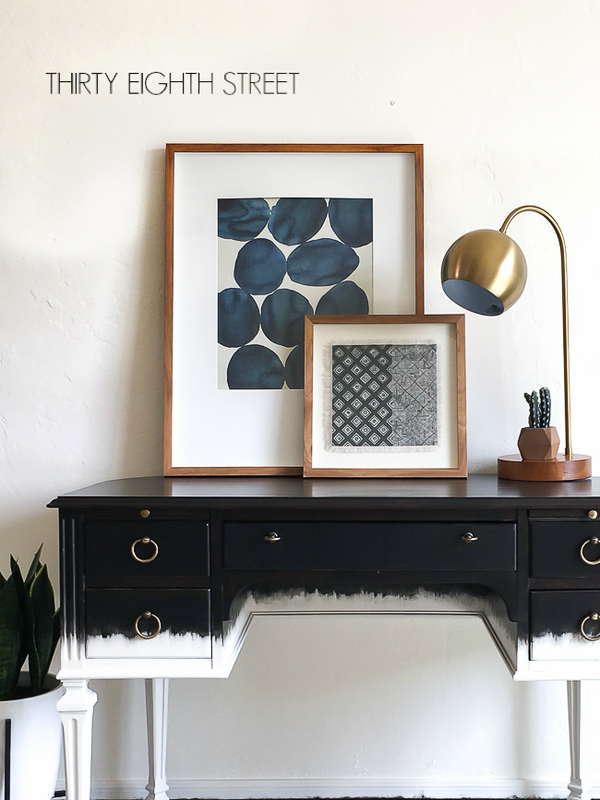 Whether you love our abstract desk makeover or not, I hope you've been inspired to stretch yourself to try something new! 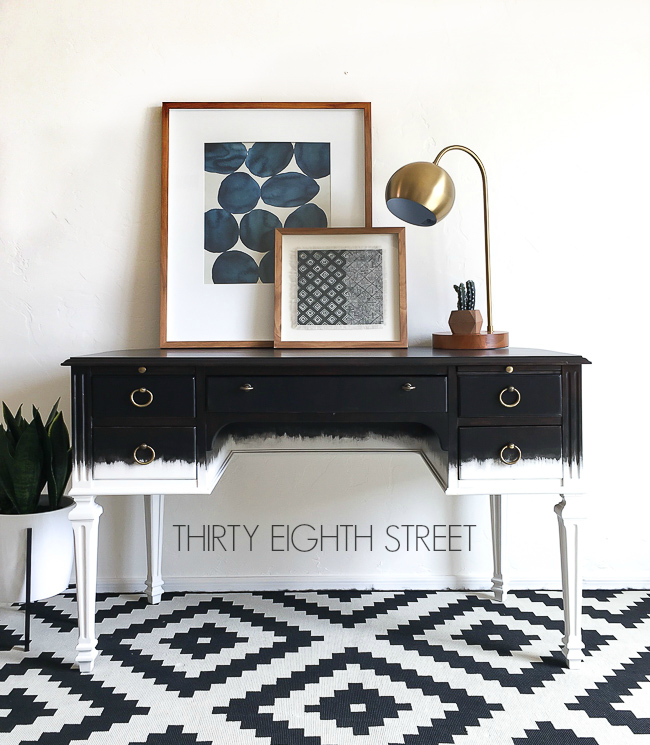 If you liked this tutorial and desk makeover, we'd love it if you'd share it on Pinterest or Facebook. 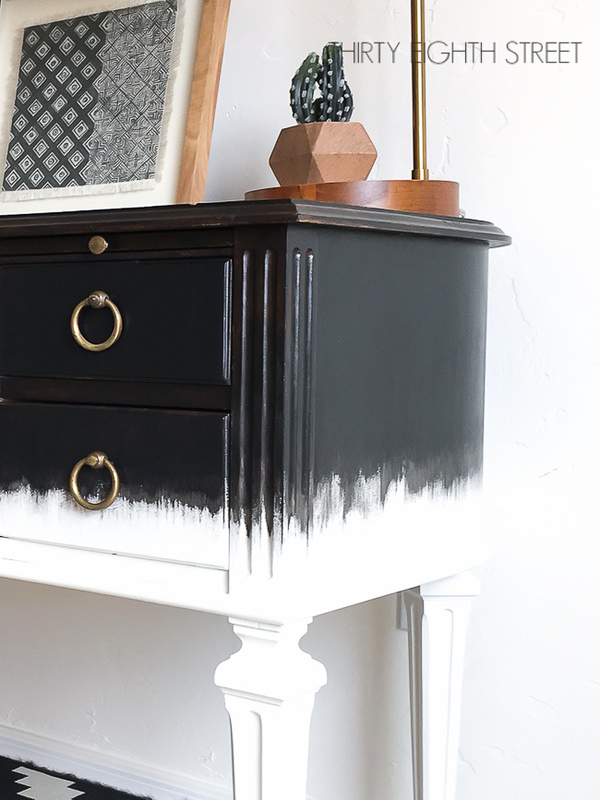 For additional tutorials like this one check out our Natural Furniture Distressing Technique, our Balayage Inspired DIY Painted Media Console Makeover or stop by our Furniture Tutorials & Resource Page for LOTS more how to's and refinished pieces. 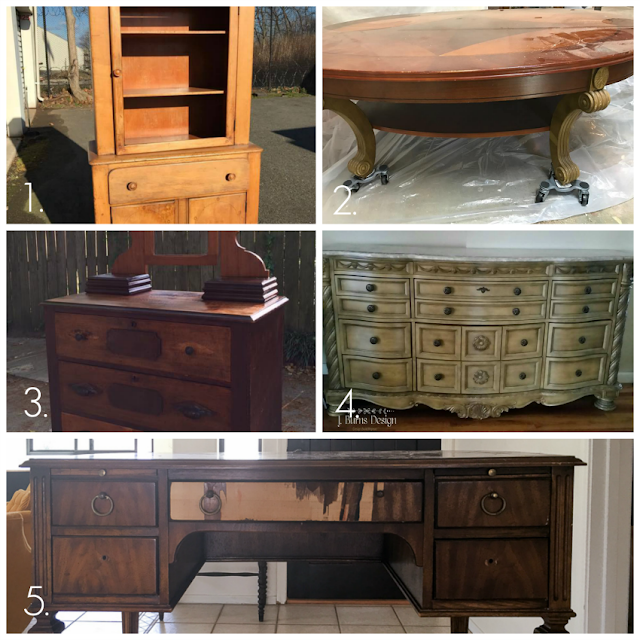 Do you love a good furniture makeover? Me too! Check out and see what my DIY Furniture Refinishing friends decided to do with these outdated furniture finds! Another gorgeous makeover. I love the contrast and you always find such interesting pieces to transform. This desk was given to me by a friend. I loved that it had curved around. It was calling for something different and fun! Thanks, Debra! This technique really made the desk such an interesting piece. 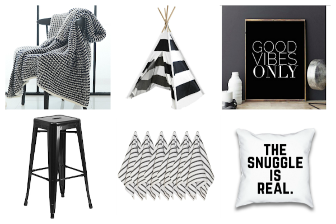 I love how unusual it is and the black and white are such a bold combination. It's stunning! Black and white is my favorite combo! Thanks so much for stopping by, Jenny! Have a great week! What a gorgeous piece! Love the black and white, so pretty. Sharing on FB & Twitter. Thank you for sharing on Merry Monday! Have a great week! 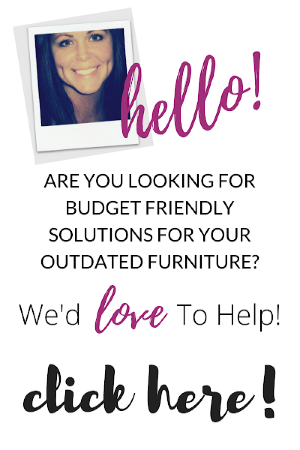 Thank you for sharing our desk on your social media channels! Always a pleasure to visit you each week! Thanks again! It's really cool the way that turned out! I've never seen anything like it. Definitely want to try it out sometime. Thanks for stopping by the Family Joy Link Party! I hope you'll give this technique a try! Thanks, Sammy! oh my goodness! I love that! Yay! It's kind of funky, right?! Thanks, Jessica! WHat a beautifully unquie piece!! 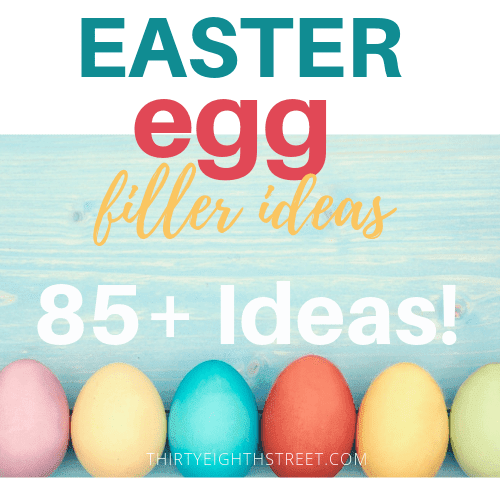 I need to find a something to try this with :) Thanks for sharing at Family Joy Blog linky party! If you give the technique a try, I'd love to see yours afterwards! Thanks, Crystal! Pinned this for future reference. Visiting from Up To Date Interiors blog party! Thanks for stopping by! I hope you'll be brave and try our technique sometime in the future! That turned out beautiful! I'm going to have to try this technique on my next piece. Love it! I'm so glad that you like it! I'd love to see yours when you're all finished! It certainly looks like ART to me! And to think someone was going to throw it away! This looks awesome. Thanks for sharing with me at Family Joy Blog Link Up Party this week! This is so beautiful! What a fabulous technique! Thanks for making my day, Christine!